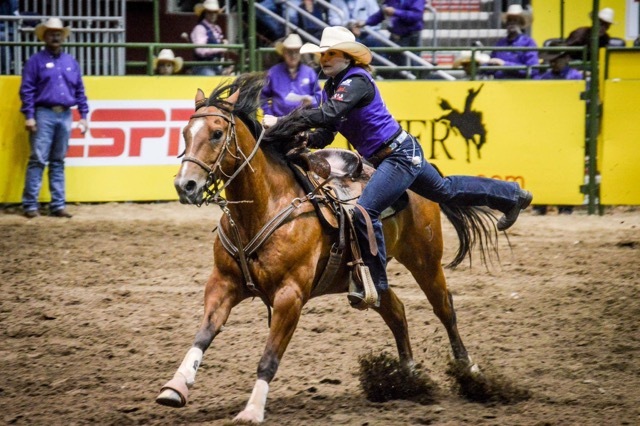 As Tarleton State University rodeo athlete Baili Collins enters her fifth and final year of college rodeo, she plans to leave on a high note by again qualifying for the sport’s top national event. The 23-year-old has qualified for the College National Finals Rodeo every year while working on her undergraduate degree and is on her way to qualify this year as well, said Head Rodeo Coach Mark Eakin. Halfway through the rodeo season, Collins is winning the Southwest Region in the goat-tying event with 595 points, 100 points above the current second-place competitor. The Southwest Region is comprised of 17 rodeo teams from both junior colleges and universities. The Tarleton rodeo team has 108 members. Collins began riding horses at a very early age. Rodeo was a family sport and she looked up to her parents and her aunt, all of whom competed in rodeos. She tied her first goat when she was still in the five-and-under age group. “The first time I was on a horse was the day they brought me home from the hospital. My dad took me on a ride. Yeah, that doesn’t sound safe at all,” Collins said with a laugh. Eakin said he has known Collins since she was competing in junior rodeos. “Baili has been a fierce competitor since she was a little girl,” he added. Collins moved to Stephenville from Oklahoma to compete at Tarleton and said she had no idea what to think about the transition. To prepare for the college rodeo competitions, Collins visits the gym whenever she can. She likes to lift weights, but isn’t big into cardio. Along with fitness, her practice routine is a huge part of her success. She also attributed her success to her goat-tying horse, Jóse. “He’s a huge part because he makes it really easy. I can just focus on me and not worry anything about him,” Collins said. Collins graduated with her bachelor’s degree in kinesiology in fall 2017. She is currently balancing team practices, working at a job and getting her Master of Business Administration degree. “It’s a lot more time management. You have to be really disciplined. It’s easy not to always be motivated, but you have to stay disciplined,” she said. Collins added she feels good about the spring outlook. Eakin said Collins will be missed. Collins competes in both the goat-tying and the break-a-way roping events at the college rodeos. The rodeo team will travel to five different competitions this spring. One of Collins’ favorite rodeos is the hometown Tarleton rodeo.